At St. Paul Lutheran High School (SPLHS) in Concordia, Missouri, international students are learning the Lutheran faith through LHF-translated catechisms – thanks to a Thrivent Financial Action Team grant. The international students come to SPLHS from a variety of religious backgrounds, but while at the school, they are required to take a Lutheran religion class each semester. Many have little or no knowledge of the Christian faith. When learning about SPLHS, “I saw a real opportunity for these students to have good Lutheran literature in their own language – both for studying and for taking home with them,” said Rev. Rod Benkendorf, LHF development associate. As a Thrivent member, Rev. Benkendorf knew he could apply for a $250 Action Team Grant, which Thrivent offers to all members as seed money for a one-time fundraiser, service activity or educational event that will make a positive impact in the community. Through a Thrivent Action Team grant, over 300 people learned about the LHF mission and enjoyed a time of fellowship at a Michigan mission rally. Rev. Benkendorf completed the short application for the $250 Action Team gift card, which he then used to order more than two dozen books from the LHF website. Other Thrivent members have chosen to use their Action Team seed money to cover the costs of a special event, which in turn raises awareness and support of the LHF mission. In November 2018, the Thumb East and West Circuits of the Michigan District hosted an educational mission rally, attended by more than 300 people. A Thrivent member applied for an Action Team grant and used the $250 seed money to purchase food for the event. The freewill donation collected at the dinner is helping LHF to publish Lutheran books for the people of Ukraine. 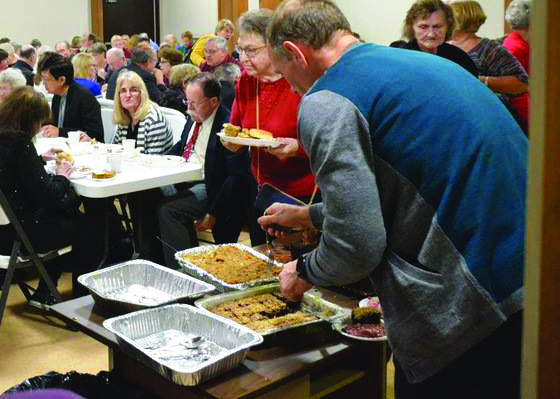 “We have found that Thrivent is ready and willing to support projects, especially those that help to deliver the Gospel through community outreach and missions,” said event organizer Rev. Steve Bagnall of Good Shepherd Lutheran Church in Cass City, Mich.
Rev. Benkendorf said he believes there are many settings where LHF books, funded with a Thrivent Action Team grant, could be beneficial in sharing the Gospel. “If a congregation were to reach out to a language group (or multiple language groups) in their community, especially if they were to couple this with a social and/or community event, that would seem like a great way to make use of the Thrivent Action Team resource,” he speculated. “A family could very well have a neighbor (or neighbors) whose first language is not English and would like to share Gospel-oriented literature with them in their native language, or have a social event to get to know them and share Christian information. “A school might decide to reach out in its neighborhood and invite a language group to receive Christian literature. A church or school or group of Christians may be taking a mission trip overseas and want to take literature in the language of the people. If there is one person in any of these situations who is a Thrivent member, they could apply for an Action Team. It’s a wonderful way to reach out with the love of Christ!” he concluded. Part of the application for the Thrivent Action Team grant asks how the funds will be used. For some Thrivent members, it might be confusing or intimidating to know what to write, but Rev. Benkendorf explained that it’s not as difficult as it first might appear. Please note: While LHF books are always free of charge to the ministries and individuals who need them, gifts like the $250 Action Team card provide the funds that allow LHF to continue this translation and printing. To direct your Thrivent Action Team gift card to the LHF mission, go to the LHF Donation page and use the gift card as you would a credit card.